The "New Kingdom" is a period of time during the history of Ancient Egypt. It lasted from around 1520 BC to 1075 BC. The New Kingdom was the golden age of the civilization of Ancient Egypt. It was a time of wealth, prosperity, and power. What dynasties ruled during the New Kingdom? The Eighteenth, Nineteenth, and Twentieth Egyptian Dynasties ruled during the New Kingdom. They included some of the most famous and powerful of all the Egyptian pharaohs such as Ramses II, Thutmose III, Hatshepsut, Tutankhamun and Akhentaten. Before the New Kingdom of Egypt was a time called the Second Intermediate Period. During this time, a foreign people called the Hyksos ruled northern Egypt. Around 1540 BC, a ten-year-old named Ahmose I became king of Lower Egypt. Ahmose I became a great leader. He defeated the Hyksos and united all of Egypt under one rule. This began the period of the New Kingdom. It was during the New Kingdom that the Egyptian Empire conquered the most lands. Pharaohs launched wide ranging expeditions taking over lands to the south (Kush, Nubia) and lands to the east (Israel, Lebanon, Syria). At the same time, Egypt expanded trade with many external nations and kings. They used gold mines in Nubia to gain great wealth and to import luxury goods from around the world. The pharaohs of the New Kingdom used their wealth to build massive temples to the gods. The city of Thebes continued to be the cultural center of the empire. The Temple of Luxor was built at Thebes and grand additions were made to the Temple of Karnak. Pharaohs also built monumental Mortuary Temples to honor themselves as gods. These included Abu Simbel (built for Ramses II) and the Temple of Hatshepsut. One of the most famous archeological sites from the New Kingdom is the Valley of the Kings. Starting with the Pharaoh Thutmose I, the New Kingdom pharaohs were buried in the Valley of the Kings for 500 years. 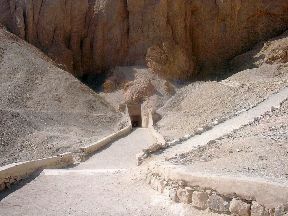 The most famous tomb in the Valley of the Kings is the tomb of Pharaoh Tutankhamun which was discovered largely intact. It was filled with treasure, art, and King Tut's mummy. It was during the reign of Ramesses III that the powerful Egyptian Empire began to weaken. Ramesses III had to fight many battles including an invasion by the Sea Peoples and tribesmen from Libya. These wars, combined with severe drought and famine, caused unrest throughout Egypt. In the years after Ramesses III died, internal corruption and infighting in the central government became worse. The last pharaoh of the New Kingdom was Ramesses XI. After his reign, Egypt was no longer united and the Third Intermediate Period began. The Third Intermediate Period was a time when Egypt was generally divided and under attack from foreign powers. They first came under attack from the Kingdom of Kush from the south. Later, the Assyrians attacked and managed to conquer much of Egypt around 650 BC. There were eleven pharaohs who had the name Ramesses (or Ramses) during the the Nineteenth and Twentieth Dynasties. This period is sometimes called the Ramesside period. Hatshepsut was one of the few women who became pharaoh. She ruled Egypt for around 20 years. The Egyptian Empire was at its largest during the rule of Thutmose III. He is sometimes called the "Napoleon of Egypt." Pharaoh Akhenaten converted from the traditional religion of Egypt to the worship of one all-powerful god named Aten. He built a new capital city named Amarna in the honor of Aten.